Free Sewing Patterns: Learn the basics to Pattern Assembly for PDF Sewing Patterns. 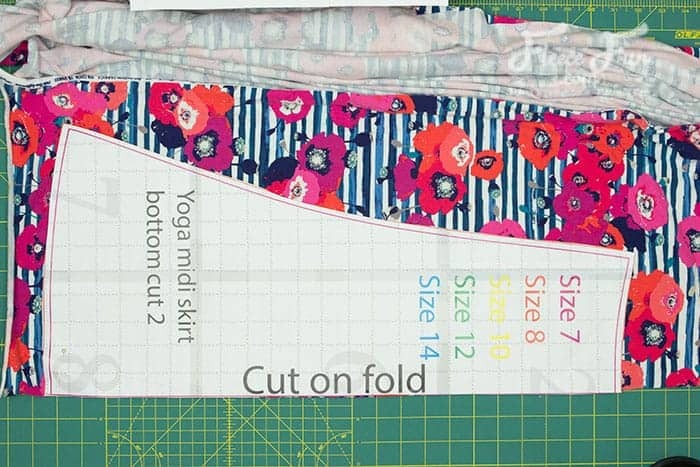 Learn the tips, tricks ( and to avoid potential pitfalls) when putting together a digital sewing pattern that you print from home. If you are just starting sewing or have been sewing for a while but are a newbie when it comes to digital patterns. 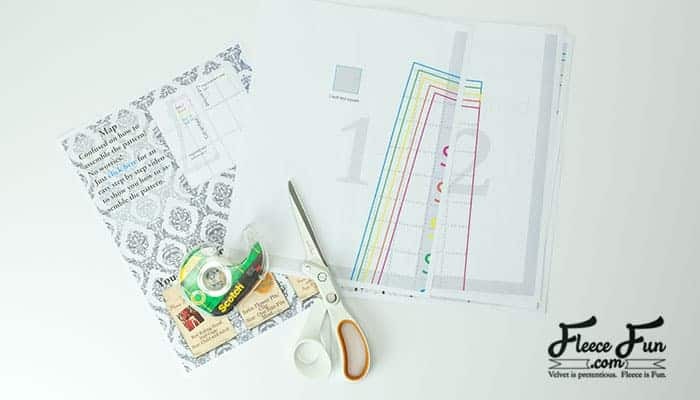 This quick tutorial will walk you through the ins and outs of how to assemble the patterns and avoid the pitfalls of printing your pattern from home! First things is first you will need to download and print up the pattern. Make sure that you have enough paper and ink in your printer. Also it’s best to print in Adobe PDF and NOT from your internet browser. I have found that some browsers have a tendency to mess with the size of the print, and thereby making the pattern wrong. If you’re worried that this has happened, there’s an easy way to double check that I’ll show you. One some patterns a 1 inch square is provided so you can double check to make sure that your pattern has printed to scale. Simply measure the squares height and width to make sure that you pattern isn’t warped in any way. I confess that not all of my patterns have this handy square. But I do have this – pattern size check that you can print up to double check your printer. 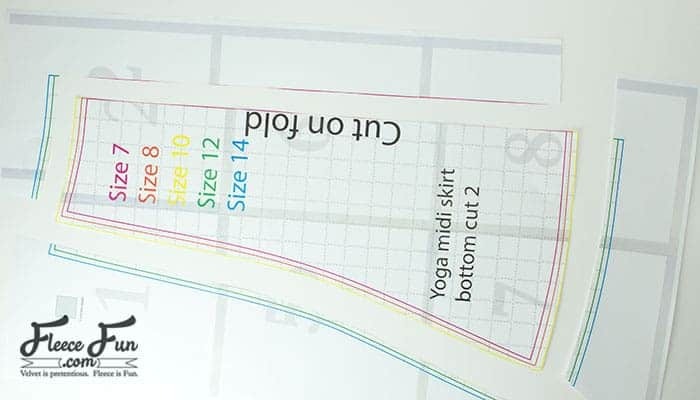 You can download that here – Download and print the pattern size check here – to make sure that the patterns are printing up correctly. 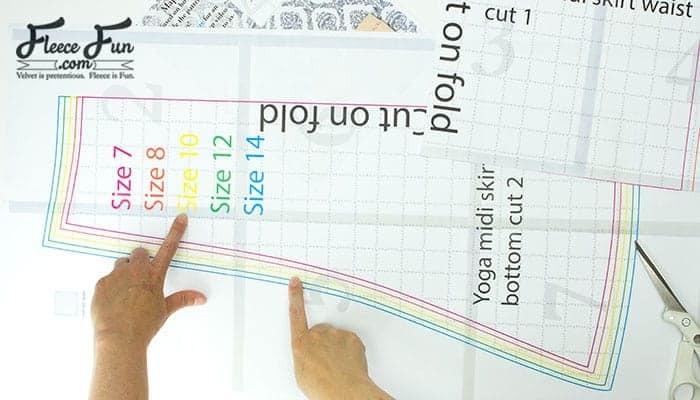 Unless the pattern fits onto one page, you will need to tape the pattern together. The pattern will come with a “map” that shows you how the pattern should come together. 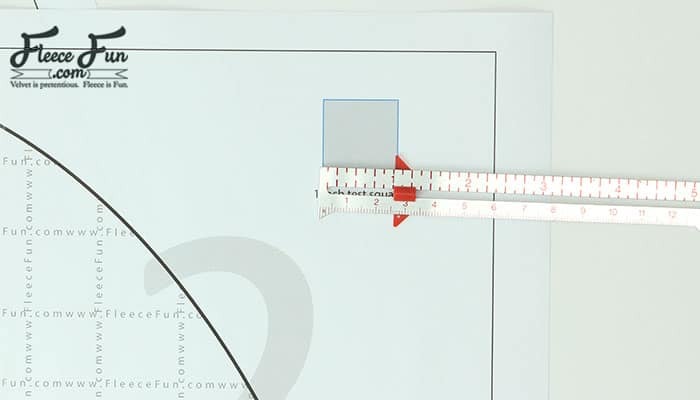 Since home printers typically don’t print right to the edge of the paper, a white gutter that is not part of the pattern is around each page. Simply cut this gutter off to assemble your pattern. Line up the lines and tape the pattern together. The “grey lines on this pattern overlap to make the pattern. Use the outline of the pattern and the words on it to also help you line it up properly. Some patterns can look a little different. In this pattern’s case instead of having gray overlapping lines, you line up the diamonds for Pattern Assembly. Once you have the entire pattern assembled you will need to cut it to the right size. I don’t want you to ruin your nice sewing scissors! 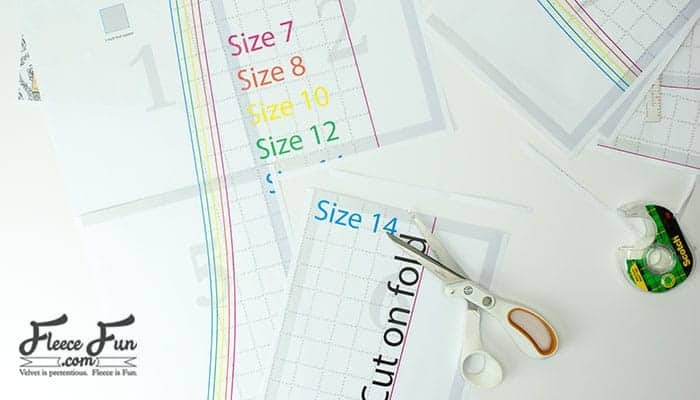 Make sure that you find the correct size by cutting to the corresponding color or pattern. Using your paper scissors cut away the excess. That’s it! You’ve completed Pattern assembly. Your pattern is ready to go and the beauty about the paper is that it’s really durable and you can use this pattern many times once it’s been assembled. 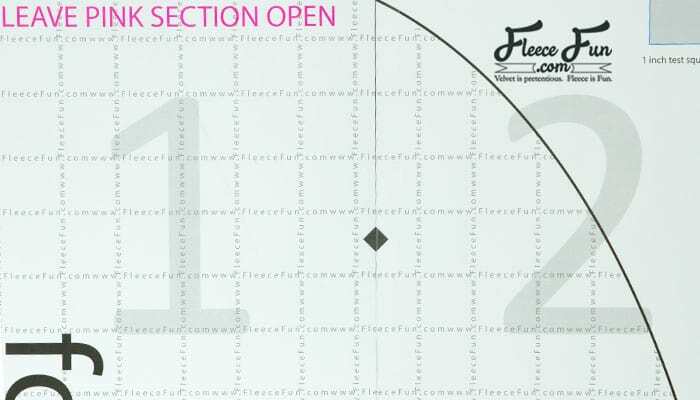 I like to keep my patterns in large 12″ by 12″ envelopes like these for storage. Because you are printing the pattern from home, in most cases you will have to assemble parts of the pattern. On the second page there is a picture of what the completed, assembled pattern will look like (it’s at the top of the page so you’ll know it’s not the pattern). The pages following that picture are the pieces to the pattern. All of the pages overlap .5 inches. At the top and bottom you will notice small lines ( _ I )these are guides to help you line up the pages. 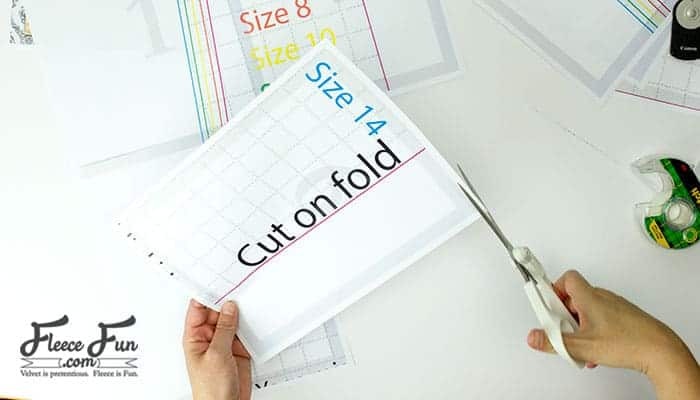 Because the paper you’ll be printing on is much thicker than the tissue paper of most patterns, I recommend pre- cutting the pattern with your paper scissors so you don’t dull your sewing scissors. Now you’re ready to use the pattern! The great part is that you can just store these patterns and use them multiple times because they are so sturdy. 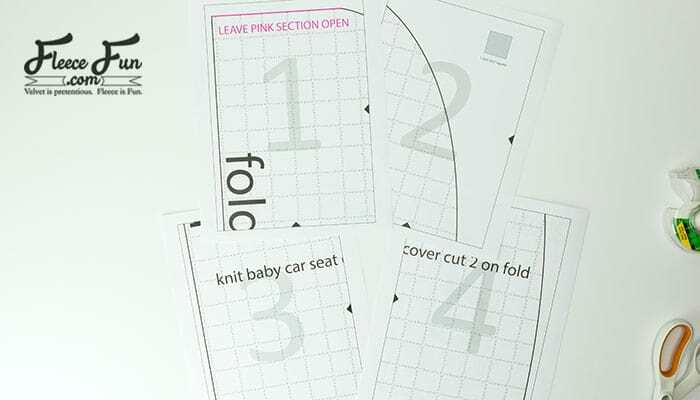 Download and print the pattern size check here – to make sure that the patterns are printing up correctly. Hello, I am going to try and make the little red riding hood. I have printed the pattern and am about to assemble the pieces. The grey line that I am supposed to overlap throught the pattern is printed about 3 cm from the short side of the paper and about 1 cm on the long side, is this supposed to happen? I am a bit worried that my printer has made each picture smaller and that my pattern will be to small. I hope you understand what I’ve written. 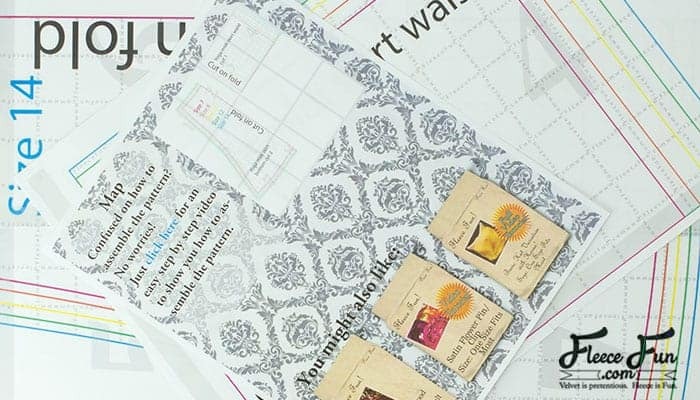 The pdf is designed for typical US paper which is 8.5 inches by 11 inches (215.9 mm × 279.4 mm). So if you are using a different paper size that can be a factor. There should be some white space between the gray line and the edge of the paper – I didn’t make it a full bleed ( color going to the edge of the paper) on purpose as most at home printers don’t have that capability. My guess is you are using a different paper size, but it’s printing fine. Just make sure that you are printing at 100%. Also be sure that you do not make it fit the paper or other options that can cause the ration to become skewed. It’s printed a few cm from the edge of the paper, sorry. I am making the Little Red Riding Hood cape and am curious about the tie. There isn’t a pattern piece for it. Am I to just use the remnants to create the tie from my own dimensions? The tie – as mentioned int he directions is made from ribbon or elastic with a button. You can make the tie from scraps if you choose, but I don’t know if any would be long enough to make it look good. Could you tell me what size and what pattern you are dealing with? I am making the Thankful Apron. You have the pttern making the apron with a waistband. I want the waist band and also the belt that ties in the back. you have no instructions on how to add the belt. Do I just sew it to the bottom of the waist band ? I sent a note before to you but never got an answer. Sure would be nice to be able to chat with you to ask questions. I do not do twitter. I am confused by what you mean by “belt”. If you are referring to the waist tie straps those are clearly mentioned in the tutorial. You cut two waist tie straps (mentioned in step 1), finish the edges (step 2) then add them at the appropriate time ( step 5). This is also mentioned in the video tutorial. If you could clarify on where you’re confused I will try to explain better. The video says that if adding a waistband to cut an additional piece of the tie srap pattern and then trim to fit bodice section before attaching. The video is great! Even experienced clothing makers can learn a new and easier method now and then. I watch and enjoy many sewing and pattern making videos and have picked up a thing or two to make my sewing experiences easier. Happy Sewing! I’m trying to make the child size red riding hood cape, but like Kay mentioned above I can’t seem to get the on back piece to match up win the front. Should there be two back pieces? Thanks. hi angel, i am making the thankful apron and have a question about the lining. when ironing under the bottom 1 inch do you fold it twice or just once. i did it once 1 inch and it doesn’t match up with the bottom of the bodice. It’s supposed to hang down little bit from the bodice to give you some room to play when top stitch on the other side. Sounds liek you’re doign everything right. You need to go to this page – http://www.fleecefun.com/basic-hat-with-ribbon-how-to.html and click on the pattern envelope in the size you need. Thank you for all these lovely patterns..My daughter is now 30 weeks pregnant, and this excited Grandma is now able to make her some homemade items for babe, something stitched with love is always the best gift…. Hello I am planning to make the Little Red Riding Hood Cape and I was just wondering how long each of the three different lengths are? Also are the lengths of material you have written at the start for the longest sized cape? I’m sorry but I don’t have the length measurements on hand. Just assemble the pattern and hold it up to your shoulder to see about the length. Yes the fabric lengths given are for the longest cape. I am wondering what type of fabric I should use to line a child’s polar fleece jacket I am making . . . any suggestions? I really wish patterns were just put on line to print, not have to download and go thru PVF or whatever…. It gets very annoying and I don’t like downloading on my computer….. I am sorry for your frustration. Using a pdf file is pretty standard these days. Depending on how your computer is set up and what browser you are using you can print it off fairly quickly, just be sure you have a copy of Adobe pdf on your computer ( most computers come with it already loaded). I wish the instructions were print friendly. I have very slow internet at my house. I go to my daughter’s house and use her computer to find and save patterns. Then I go home and print them. I watch the instructions but can’t always remember the steps (getting old here too Grammy Roo). But is is so very time consuming to save the instructions and it would take hours to upload them at home. Heh! How about print friendly instructions??? What do you all say? Oh and Angel. I love your patterns. They are so lovely and easy to put together. Your instructions are pretty good. Wish the fleece pants were in bigger sizes. I am not too good at enlarging them. Something always is whack when I do. LOL. I have just found your site, and want to learn how to do the teen apron. I have had an unfortunate problem in down loading different tool bars. I already have Adobe, is there a way I can just get the pattern to open in Adobe without installing the PC Doc tool bar, as that almost ruined my computer. Adobe is all you need just click on the pattern envelope or picture to get the pattern. Thank you for taking time to leave such a positive comment! A lot of the comments I deal with are trouble shooting issues, so such a wonderful compliment is nice to have. I am loving this website but for the life of me nothing happens when I choose to watch the tutorial to make the Child Large hat in the Halloween Hat Pack- just the plain hat. Help! Thank you for the patterns and instruction. My name is Daniel, yes I am a man. I just bought an old White 262, it was so cool looking that I had to have it. It looks like classic car that has been restored. I’m not sure if that is a good enough reason to buy a sewing machine, but I did it anyway. I have done some sewing as the Supply Sergeant in the US Army, so I can sew a little bit. I live in Minnesota so I am going to make some mittens. My question concerns the grid on your patterns, does each square represent one square inch? My girls (2 and 3) love the fleece mittens, I figure I can put this old White to work. Personally I think it’s awesome that you sew. No the grid is not an inch pattern. You can do the pattern size check here http://www.fleecefun.com/pattern-assembly-instructions.html – to see if it is printing correctly. I made the car seat cover for my 1st grandson, and it turned out just awesome! thanks for the pattern. I haven’t sewed in a long time but needed something for a party. I am teaching myself to sew. I am excited to try making something I think I can complete. Thanks for the free pattern. . I have retired and finally have time to relax and sew. Thank you so much for the pattern. I just finished the cape for my daughter. The pattern is very good. The only thing we changed are the shoulders. We made the silhouet a little rounder. where do I print out the pattern for Poppy? I cant find where to click. I would love to use this vest pattern, do you have it in a smaller size? I’m making it for a 2 year old! Sorry what you see is what is offered.